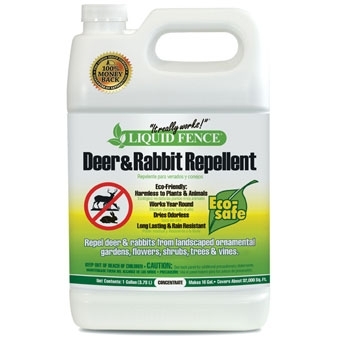 LIQUID FENCE 1GAL DEER & RABBIT REPELLENT CONCENTRATE. Concentrate. Long lasting rain resistant, 100% guaranteed to work, easy to use. The product works year round and is environmentally safe. Won't harm the animals and is bio-degradable.